Review Summary: TheHairstyler is my favorite virtual hair styler program to date! It's the one I recommend to my clients when they want to find a new hairstyle. I find it very easy to use. And although it is not 100% realistic it is more realistic than most virtual hair styling programs (The Wall Street Journal and Vogue agree with me). It is certainly realistic enough to see whether the selected hairstyle and color suits you. 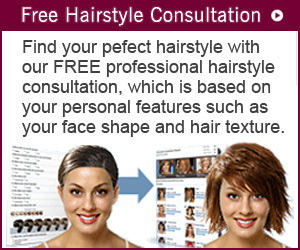 Try it yourself and use the hairstyle consultation feature (members only) to see recommendations for your face shape. I also recommend signing up for virtual hair styler membership (see below)so you can upload your own photo. It really does make a difference seeing the hairstyles on your own face. Pros: Easy and fun to use. Lots of great hairstyles to choose from -- both salon styles and celebrity styles. About as realistic as the virtual hair styler programs get. Cons: The face shape quiz isn't always accurate, but I can help you with that: (work out your face shape here). No ability to search by face shape, but selected styles do inform you which face shapes they suit and you can get recommended hairstyles for your face shape through the Hairstyle Consultation feature. Can't change your eye color. Pricing Virtual hair styler membership allows you to upload your own photos and to use the sharing options. Price US$14.95 for 3 months membership. Free trial? Yes. The Hair Styler membership is now totally free. How realistic? Pretty realistic. Certainly good enough to work out what suits you. Virtual hair styler recommendations by face shape? Yes. By filling out the Hairstyle Consultaion. The consultation also takes various hair attributes into account which is good. Firstly, it's now free if you use only the TheHairstyler's models and don't want to use the sharing features. TheHairstyler has hair styles for both men and women, although women have the most styles to choose from. There are both salon and celebrity hairstyles from around the world. Included in the ways to search is a "celebrity finder". This is useful if you just want to see celebrity styles for men or for women. You can also search celebrities alphabetically, by name or see the top 15 celebrity styles or random styles. There's also an option to sort your results by the name of the hair style or the date it was last modified (again it didn't look as if this was working). I do like the way the hairstyles returned from the query let you know the date they were added. I always wonder how contemporary a style is! In fact it would be nice to be able to search by date added, for instance to return all hairstyles added since the beginning of the season! It would also be nice to be able to find hair styles by face shape. The way to do this currently is to complete the Hair Consultation form. This is accessed in the Makeover menu. Although you can also see which face shapes a style is recommended for by clicking the "View Hair Info" button next to each hair style in the search results. I love the hair consultation which gives you recommendations for your face shape, hair type and your skin coloring. Although because of the skin tone I selected (cool overtones and ruddy undertones) I came out with recommendations for cool hair colors when I'm actually warm coloring (from my skin undertones). Because of this (identifying your coloring and the effect of changing your hair color is complex and needs a practised eye) I suggest you confirm with your hairdresser that the color and style will work with your hair and coloring (in fact you should do this anyway). You can also search for hairstyles from the Virtual Hairstyler page. Select the Hairstyles option from the Styling menu. When you search for hairstyles this way one hairstyle is placed on your selected model or photo and the remaining hairstyles are placed in the right hand Navigator pane. This is nice. I would also like to see the results from the Hairstyles page search results placed in the Navigator to make it easier to switch between the different styles you've found. And the results of the hair consultation should also be displayed there when 1 style is tried. When you've identified a style you like click the "Try On" button. You then have various options including changing the hair color, searching for and selecting a new hairstyle, changing the model you're using or switching to one of your photos. It is easy to upload your own photo. In fact you can load more than one photo so you can see what a hairstyle will look like with your eyeglasses, for instance. When you've uploaded your photo you are prompted to "edit photo" to make sure it's the correct size and positioned correctly for the hairstyles. There are controls available that make it easy to rotate, enlarge, shrink and position your photo. When you try on a hair style you have a further option to position and re-size your photo to fit the hairstyle. However, there's no option available to flip the style so you can see the parting on the other side of your head. I have a very poor photo of me loaded (its fuzzy because the photo I uploaded was too small and my shoulders are not square on to the screen), but even so it was easy to see which styles look best on me. Much easier than trying to visualize the same styles on one of the models. Each style also has information about it in the bottom left corner including information on how to maintain the style and which face shapes it works best for. 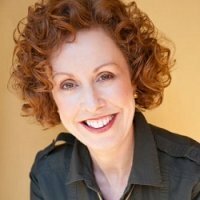 TheHairstyler is a great resource for finding your next hairstyle and/or hair color. I suggest you start with the hair consultation. Try the TheHairstyler and see for yourself.